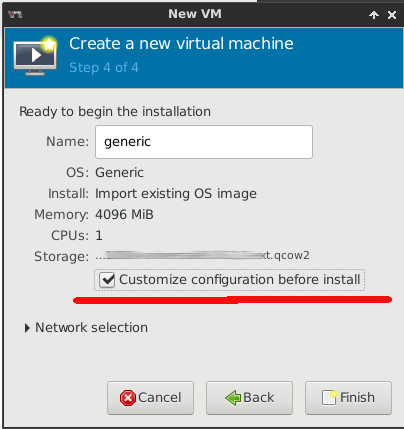 The goal of this article is to cover a complete configuration of OpenVSwitch and KVM networking to have ports of the virtual switch allowing trunking toward the KVM guests. The reason to do that is to give the opportunity to arrange topologies between routers running as KVM guests connected using trunks instead of physical (virtual) links. In this way, using a single port on the virtual routers, you can create sub-interfaces within the same vlan to have connectivity only between routers that have that particular sub-interface/vlan. Everything I am going to do is on a Debian GNU/Linux Host that has already installed OpenVSwitch and KVM (on Internet there is a lot of documentation to cover these topics). We will dedicate our attention on the creation of a virtual switch with OVS and on the configuration of KVM networking. Once you click on “finish” you will be given the opportunity to modify your hardware. As I said before I suggest you to create as many network interfaces you think you will need to use at a later stage.